Summary: Alder the Mender has bad dreams regarding his dead wife. He sees her begging for help at the wall dividing the living from the dead. Unable to sleep, he seeks the aid of the ex-Archmage, Sparrowhawk, who in turn sends him to his pal, King Lebannen. 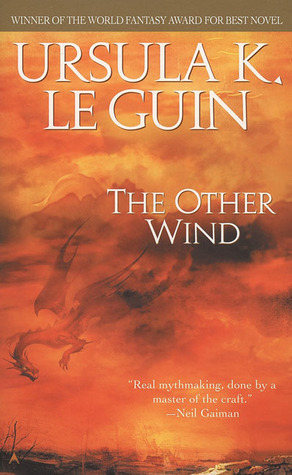 Cons: Ursula K. Leguin’s The Other Wind reminds me a lot of Arthur C. Clarke, not only in her unique, minimalist style, but in her threadbare plotting, which somehow goes from making you want to fall asleep to giving you a new perspective on life. It’s a lot like the movie, 2001: Space Odyssey, which I tell my friends is a very boring, but very excellent movie. Sometimes this formula works and sometimes it leaves you begging for more. It’s really nice to see all of the superfluous information stripped away (what so many newer novels badly need these days) to be left with the bare bones plot. I often felt that Leguin had originally written a 500 page book, which was then edited to remove 300 pages. If that is the case, that would make her the most brutal editor in the world! But sometimes, I really did want to know more. There were some characters that seemed intriguing, but not enough was said about them for me to really care as much as I could. It often seemed like lost potential. The ending of the book I would describe as surreal to the point of poetry. This is not to say that it was merely “poetic” … this is to say that it literally becomes a poem, so that meaning itself gives way to feeling. For some, this might be frustrating, and it was for me, but it was also very moving. Pros: The beginning of this book was incredible. Leguin moves right into the story, instantly engaging the reader. Alder is a character you can really identify with, and the scenes describing his dreams of death really did creep me out! The symbolism of the wall was both powerful and obvious, at first, but as the plot unfolds you realize the symbol is not quite as you understood it, and then the grand metaphor that is the The Other Wind becomes apparent. To put it bluntly: this is a book about grand themes, much like the classic literature of the past, and gives new insights into life and death, and might possibly even help readers reconsider their fear of death as well. Overall: The strengths of this book overcome its weaknesses by far. It is a poem, really, an expression about life and death which transcends the genre.